Keyword Research has become increasingly important when writing blog content which will engage their readers so they revisit the blog for more content. Aside from engaging the target audience, it’s also important from a search engine perspective. Google and other search engines rank content higher if they have keywords or key phrases with a high search volume. A number of free and paid keyword research tools are available to help uncover such keywords. The challenge with keyword targeting, however, is that your target audience responds to different keywords with varying levels of interest and buyer intent. The key to overcoming the challenge is to follow a systematic approach to keyword research to find what topics your target audience is interested in, and which ones they will most likely ignore. The common practice for keyword research is to start with a list of terms, uncover keyword phrases and what keywords competitors are targeting. What this does not take into account is that the keywords represent varying levels of interest and buyer intent. Some are searched for by prospects conducting preliminary research, some by people who are closer to making a buying decision and still others by prospects at different stages of the spectrum. In this keyword research method, keywords are categorised by their type and effectiveness. 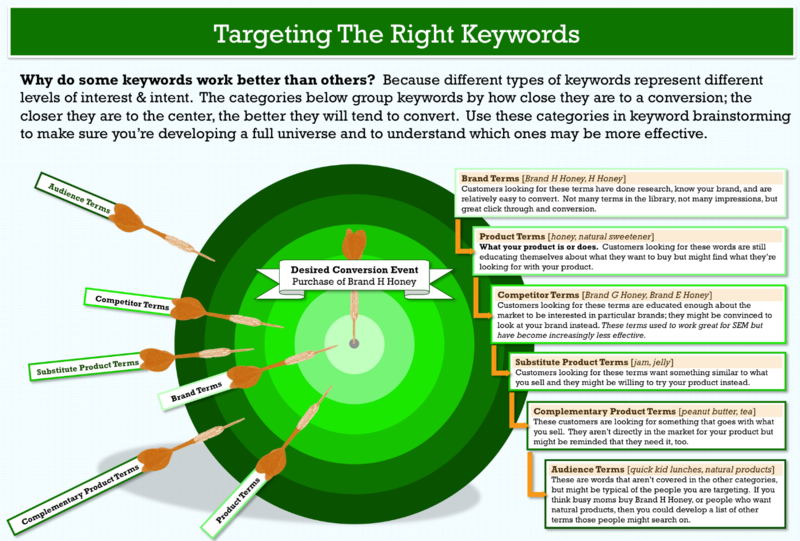 The idea is to start by focusing on keywords and keyword phrases which have the most likelihood of converting. Only when these have been exhausted, should you look for additional keywords and keyword phrases. The following infographic explains the method using a brand of honey as an example. If you’re investing money in Facebook Ads to generate leads, appointments or sales, but aren’t getting the results you expect, you may want to review your Facebook Ad copy, especially the headline of the ad. The headline for your Facebook Ad is one of the first things your target audience will look at when the ad is presented to them. You have a precious few seconds to grab attention and failing to do so could mean your prospect, however, qualified will gloss over the ad, never to return. When crafting headlines and copy for your Facebook Ads, keep in mind that it’s not just other ads which are fighting for your prospect’s attention. There are also thousands of other posts, images, videos and Live broadcasts which populate their Facebook feed. When auditing Facebook ads and other ad copy for clients, it’s quite common to find headlines which aren’t compelling enough to attract the reader. Without the right training and experience, it can be difficult to write compelling Facebook ad headlines. However, by following a few simple time-tested principles it can get easier to craft headlines which arrest the attention of your target audience. 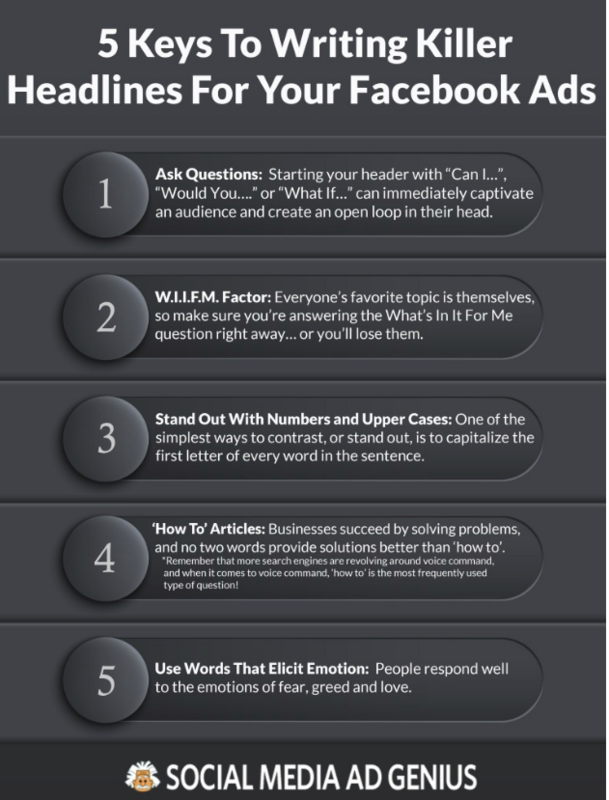 The following infographic presents 5keys to writing headlines for Facebook ads which will compel your target audience to stop and check out the ad. Get into the habit of writing several headlines and then split-testing a few to see which one gets the most attention. lead to higher conversions for your Facebook ads and deliver higher returns on your investment. The task of high-converting landing page copywriting appears to be much easier than writing copy for a complete website as there are no style guides to follow or a string of keywords to be included. All that’s required is to write just one page of copy with the goal of getting visitors to provide their contact information in exchange for actionable content they can profit from. The reality is that a lot goes into designing a high-converting landing page than what you might think. Getting visitors to take the specific action you desire is easier if you follow guidelines which have been used to create the most successful landing pages. Before writing copy for your landing page ensure you have a clear idea of the desired outcome. Only then will you be able to create a high-converting landing page with a singular focus. Lack of a singular purpose or a singular call-to-action when creating landing pages is one of the common mistakes we find when conducting copywriting audits for business owners. The intention of creating landing pages is generally to acquire a lead by persuading visitors to download a pdf, video or audio file. Nowadays, landing pages are also being used to offer free trials of software or other digital products and also for booking appointments. Every element of copy should contribute to this singular purpose, without any distractions whatsoever. The following infographic highlights the essential copy elements used by professionals in creating high-converting land page copy. The more you can use these on your landing pages, the better you can expect your conversion rates to be. SEO Copywriting plays an important part in ranking websites on search engines but is also a content marketing challenge for many business owners. Website content should be powerful enough to educate, entertain and engage the reader so they spend more time on the website. It takes a skilled copywriter to craft copy which strikes a fine balance between writing to persuade readers as well as writing to play by the rules of search engines. It’s one of the important aspects we look for when conducting copywriting audits for business owners. Search engines rank websites based on several factors and it’s important to tick the right boxes for SEO copywriting when optimising a website to secure a prime position on Google and other search engines. Writing content with important keywords in mind is important to help search engines evaluate your content for ranking purposes. At the same time, quality content which engages readers and compels them to take some form of action; whether it is to opt-in for a free report, sign-up for a trial or book an appointment is the key to moving the relationship closer to a sale. SEO copywriting isn’t about filling up the page with product or service related benefits. Instead, find out what information website visitors are looking for and create your content around their fears, frustrations and desires. In doing so, present your product as the solution to overcoming challenges or meeting their needs. 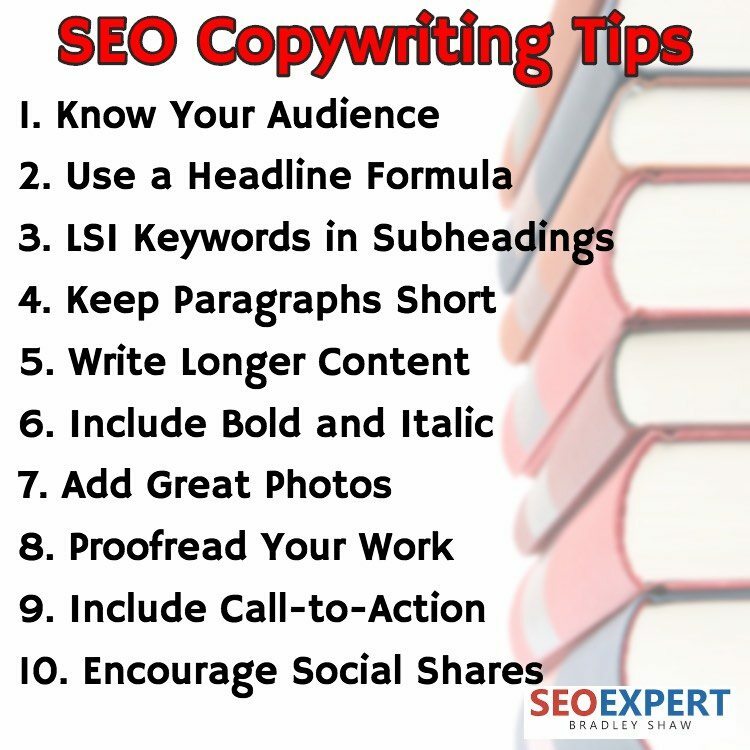 Here is an infographic which presents 10 SEO Copywriting Tips to help you achieve high rankings for your website. Use this as a checklist if you’re writing content for a new website or are looking to edit copy on an existing website with a view to improving search engine rankings. While more business owners are turning to content marketing to drive traffic to their website, the challenge they face is in creating content which isn’t just keyword rich, but is relevant, topical and of value to the reader. The enormous volume of content being uploaded on the internet every second of the day makes it increasingly difficult for business owners to think of original and insightful content which engrosses readers. As a result, a huge gap is created between planning an content marketing campaign and implementing it successfully, making it increasingly important for business owners to develop and create a results-focused content marketing campaign. Although there are several ideas you can think of to deliver content, emotionally driven content is consumed the most by viewers, and when supported by a strong proof element becomes even more valuable. To make the task of content creation simple and time efficient, it’s important to know what your audience craves for. In fact, quality content is one of the important aspects a Digital Marketing Agency will look for when conducting an SEO Audit. To help you create an effective content marketing campaign, check out the infographic below which reveals the 21 content ideas you can use to create content which your target audience will be eager to consume. What can be more embarrassing than incorrectly spelling the word embarrassed in your sales copy or social media post? Spelling mistakes are a scourge which plagues even some of the biggest brands. According to Forbes magazine, Pepsi makes four times more writing mistakes than Coke. General Motors makes two and a half times as many writing errors as Ford. Even if you aren’t keeping score, visitors who read your sales copy, blog posts, social media updates and other content notice these errors. It’s one of the first things which strike us when conducting copywriting audits for business owners. If your sales copy isn’t converting, your blog posts aren’t getting shared and your social media updates are being glossed over, it may be a good idea to take a fresh look at the content to see if you can spot any misspelt words. Sometimes the errors you make aren’t picked up by your word processor, and using a tool like Grammarly, can help in uncovering misspelt words which may have slipped underneath the radar. 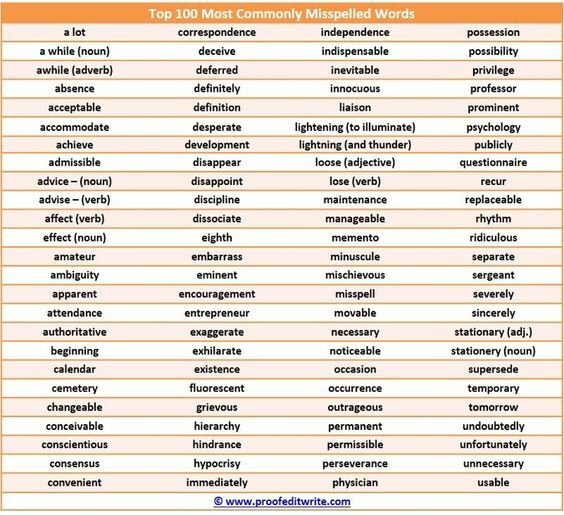 Here is an infographic which reveals the 100 most common misspelt words. Use this as a checklist every time you write sales copy, emails, blog posts or any other marketing message. It will go a long way to protect the integrity of your brand. Content Marketing has been one of the most effective strategies in SEO and Online Marketing today. With a proper strategy in place, you'll be able to drive targeted traffic from major search engines to your website. Want to find out how it's done? Check out this interesting Infographic on "How To Create The Perfect SEO Content" and find helpful SEO copywriting tips and strategies on how you can leverage your campaign using the power of Content Marketing. If you want to learn more about Content Marketing and Search Engine Optimisation, you can also sign up for our SEO Webinar and discover the best practices and effective techniques! Advertising clutter on the internet and in social media is making it harder for businesses to attract the attention of consumers to their marketing messages. The ability to craft persuasive sales copy has become increasingly important for marketers seeking to “wow” their target audience and turn them into raving fans. It's a skill that takes practice and considerable mental effort. A lot of business owners find they get stuck when attempting to write sales copy. However, when you overcome the obstacles, you'll soon find yourself writing as well as some of the highest paid copywriters. As a result, you will be able to generate more leads, sell more products and generate raving fans. You also will also not be at the mercy of Google’s frequent Penguin, Panda or other algorithm updates. Using a checklist is an effective method to banish blank page blues and ensure all the items on it have been addressed by the time you get to the end of your sales copy. The first few times you write copy, it’s a good idea to get your ideal prospect read the copy or even get a professional copywriting audit to uncover any shortcomings you may have made. The 16 tips shown in this infographic will help you get the perfect start to writing persuasive sales copy and have you writing like a professional in no time.